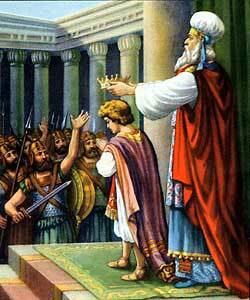 HEN JEHOSHAPHAT DIED, his eldest son Jehoram became king in Judah in his place. His wife was Athaliah, the daughter of Ahab and Jezebel, and together they did a great many wicked things. Jehoram slew all his brothers in order to get the riches which his father had left to them. He built places in the mountains of Judah and in Jerusalem for the worship of Baal. Only one of the grandchildren escaped--a tiny baby named Jehoash. He was hidden away by his father's sister, and he was kept hidden for years, in a set of chambers built round the Temple.